This book provides an outline and a critique of neo-Gramscian international relations theory, from a Marxist perspective. 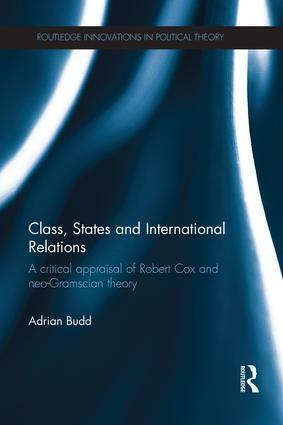 Focusing on the pioneering work of Robert Cox, but also drawing on the wider neo-Gramscian literature, this book presents a comprehensive account of neo-Gramscian international relations theory. It highlights the neo-Gramscian critique of mainstream Realist theory and the theoretical innovations that resulted from the mobilisation of Gramsci’s ideas and Cox’s emphasis on the social forces underpinning forms of state and world orders. The author explains how this is especially relevant in the current period of war and crisis, when the international dimensions of social existence continue to exercise a major influence over ‘domestic’ politics and economics, and when the interest in Marxism can be expected to grow. The book continues to provide a critique of the neo-Gramscians and of what the author argues is their one-sided reading of Gramsci. Placing coercion at the centre of a mode of production analysis of world order, the author elaborates a Marxist alternative to neo-Gramscianism that provides more robust explanations of world order dynamics and change. Using a combination of IR theory and historical explanation, including of contemporary world order dynamics and US power, this book will appeal to both students and scholars of International Relations, international studies, and international history. Transnationalization: The latest stage of capitalism?